I absolutely love having two kids. I am not going to say having two kids is easy. One kid is not easy, but most the time having two kids makes things just a bit easier. I make more sacrifices than I did with one, but many things got a bit easier. 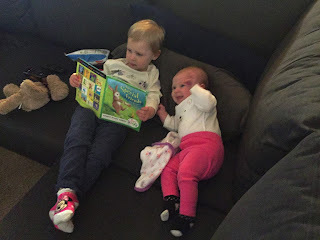 Rose reading to Heather when she was about 3 months old. All these Pros and Cons apply to the age gap my daughters have. They are just under two years apart (23 months). I don’t think there is anything wrong with having your kids further apart, I think any gaps bigger than two or three years, get harder and harder. I have some friends who have had their children about 3 years apart. Their older child can be more helpful, but they don’t seem to play together as well as mine do. From what I have read, physiologically, three years is slightly better than two. When they are two years apart they sometimes compete for attention more when than three years apart (I don’t mind needing to be a referee in the future). More than four years apart they are too far apart intellectually to get along. My younger sister is 4 ½ years younger than me, that was way too far apart and we never got along. Little to no alone time. No alone time is definitely the biggest con to having two kids. Their nap schedules rarely match up. When they do it is heaven! When they don’t it feels like forever till I get alone time. RJ is great about watching the girls while I go for my monthly Brazilian wax, make a trip to Target, or moms night out with my friends. I savor my alone time a lot more than I used to. I am the jungle gym. If you are OCD, two kids might drive you insane. On rough days, the sink is full of dishes, the laundry gets left, the clutter builds, the floor is covered in crumbs and toys. Heather (my second) is way messier than Rose ever was. She is always sticky, or covered in crumbs. She leaves soggy, half eaten snacks on the floor, and if I don’t see them before they dry, they set like cement. Now I’m not saying it’s impossible to have a clean house with more than one kid, but it takes A LOT of work. On rough days I never have the energy to clean after the girls are in bed. Sometimes the cleaning goes a few days, and that’s ok. I have kept the girls and myself alive, fed, and loved that’s all that matters. 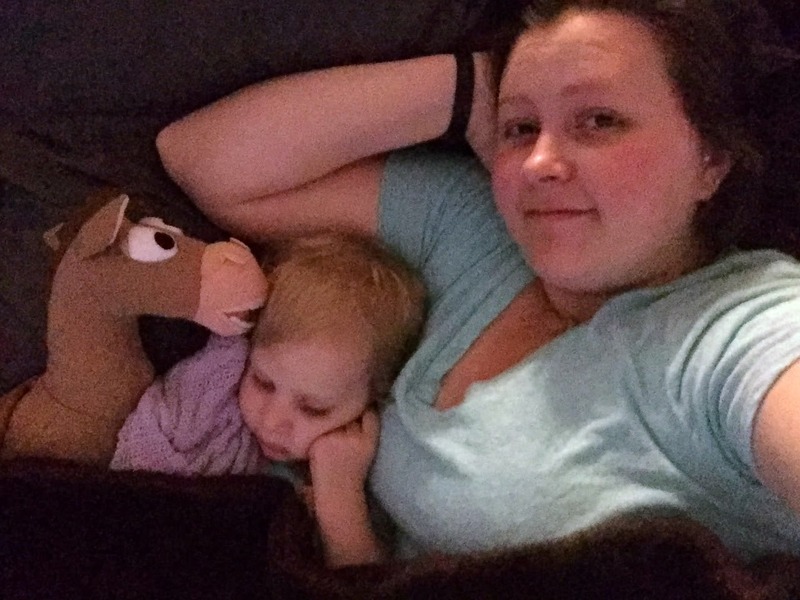 There are days when Heather goes down for nap, Rose asks to watch a TV show or movie and snuggle. I can never say no to a Rose snuggle, so leave chores for later. Rose and Heather play together all day. Rose has a hard time sharing sometimes, but they can play for hours and hours. I am sure it’s because we had them close together. I’ve noticed with some of my friends kids that are far apart, the older sibling wants to play pretend or more sophisticated games and gets frustrated with the baby. This doesn’t happen with Rose and Heather. The way my girls play so well frees up time for me to do other things. I don’t need to use the TV as a babysitter while I do the dishes or cook dinner like I did when I only had one. Rose and Heather play, chase each other, and wear each other out while I do the house work. It’s great. I can never resist a snuggle from Rose and Bullseye. Rose feds Heather for me all the time. Even if it’s just passing her a cracker, it is still super helpful. Heather is great at helping Rose calm down. When Rose is throwing a tantrum on the floor Heather will crawl up to her and just sit next to her. It always shocks me how quickly Rose calms down with Heather’s help. We try to pick up the toys every night before bed. 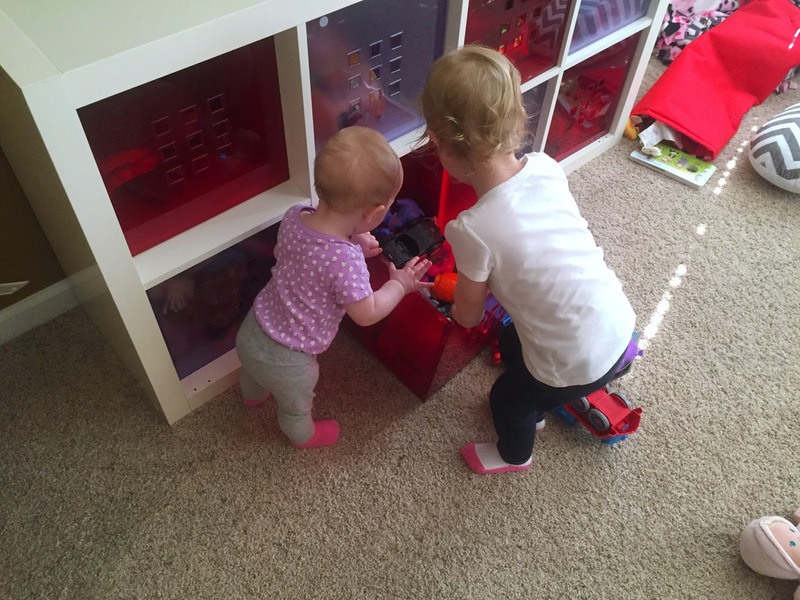 Heather at 9 months old follows Rose’s example and puts toys away. Heather will stand next to a bucket, I will pass her a toy at she will throw it in. Sometimes following each other is not always a good thing. We have a set of LEGO that looks like ice cream (LEGO Ice Cream) . If you blow through some of the pieces they make a whistling sound. Rose does this, then Heather does it too, it gets pretty loud sometimes. Most the time when Heather copies Rose it’s a good thing. I think Heater is more developed than Rose was at the same age because she has a big sister to watch. Rose is slowly learning how to share, some days are harder than others but after a few reminders she does ok. Playing in the play room. Rose loves Heather so much. If Heather is hurt Rose tries to make it better (even if she caused the pain). Rose already shows a bit of protectiveness when they are playing with other kids. If there are big kids around Heather, Rose will play near Heather too. I’m sure as they get older Rose will watch over Heather at the playground and be the protective big sister. 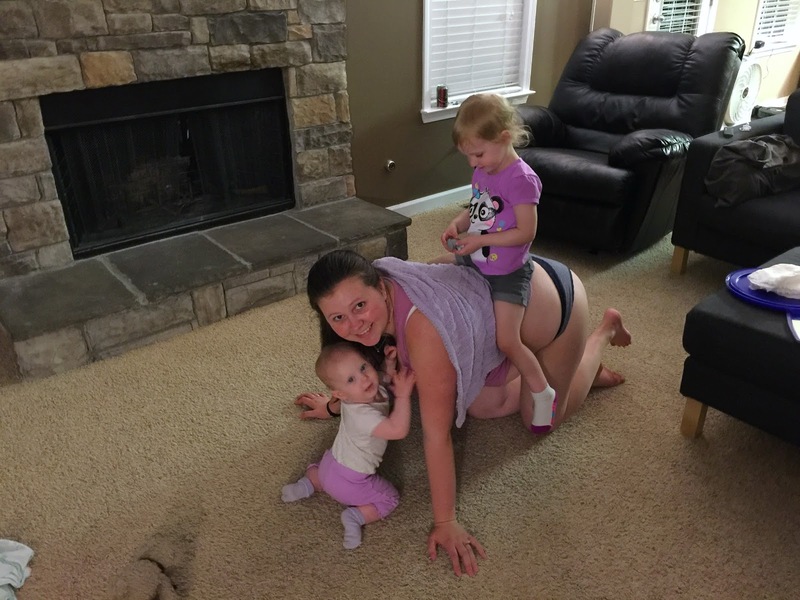 Having two in diapers is not as bad as people make it out to be. Aside from the cost it’s pretty easy. We just have a assembly line during diaper changes. Usually Heather first then Rose because Heather likes to escape. We buy our diapers from Amazon that helps keep the cost down (Rose diapers Heather diapers). I can imagine you wouldn’t want two in diapers if you did cloth diapering. Cloth diapering is not for me. Yes you have two little humans to take care of, but that doesn’t mean you have twice the work. They entertain each other, they feed each other. I do the same loads of laundry I did before Heater got here. I don’t make twice as much food. Loading them into the car is a bit of a hassle if the big one has a temper tantrum, but she can climb into her own seat when she feels like it. Two is not twice the work. We got lucky and since Heather and Rose were born in the same season. Heather fit all of Rose’s old clothes… for a while. Heather is bigger than Rose, and grew out of things quickly. By six or seven months Heather fit into the summer stuff Rose wore when she was one, but I have not bought Heather many clothes at all. I do not spend twice as much on food. I think we waste a lot less, but I don’t need to buy more yet. If Heather starts a pouch of applesauce and gets bored, Rose will finish it. We have not bought more toys at all. We don’t have a lot of toys. We just have a few good ones, LEGO DUPLO , lots of puzzles (my favorite Melissa and Doug puzzle ), a tea set (duh we have two girls), and a big block bead maze like the ones you find at doctors offices. We have an odd mixture of soft and hard toys too. We have enough they don’t get bored, but not so many it’s overwhelming if every single toy bin is dumped out. I think a lot of people have way too many toys. Shopping in Costco. 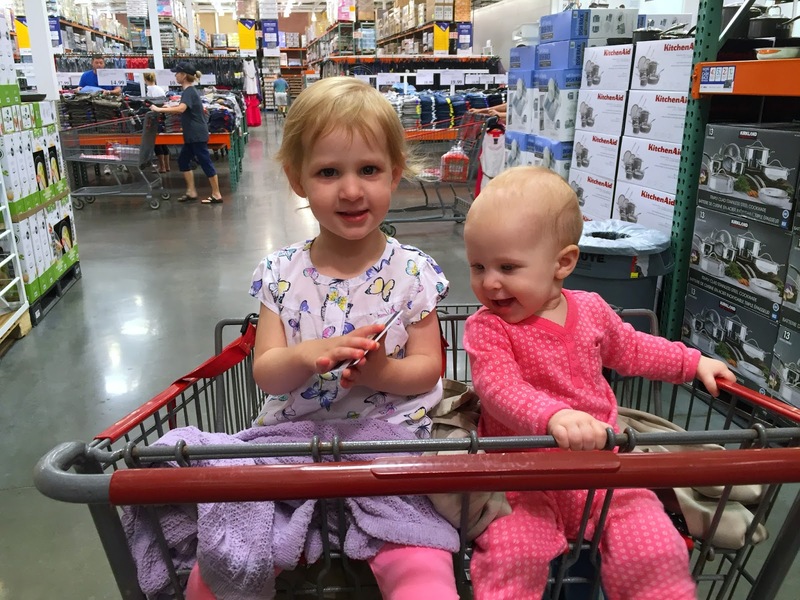 They love the double cart. I love having two kids. I love hearing their their giggles as they chase each other around the kitchen island. I love how Rose kisses Heather before her nap every day. I love seeing two cute kids piled on top of RJ. I love getting big hugs and slobbery kisses. I love having two kids I cannot wait for a third. I’m sure the dynamic will completely change but I cannot wait! Thanks for reading! I will be posting some more recipes soon. Keep an eye out for them.